Rob Gronkowski, who arguably is the greatest athlete to ever emerge from Western New York, has announced his retirement from the NFL. Gronkowski revolutionized the tight end position in his nine seasons with the New England Patriots. "It's time to move forward and move forward with a big smile knowing that the New England Patriots Organization, Pats Nation, and all my fans will be truly a big part of my heart for rest of my life," he wrote on Instagram on Sunday. "It was truly an incredible honor to play for such a great established organization and able to come in to continue and contribute to keep building success." Gronkowski, who turns 30 in May, joined the Patriots as a second-round draft choice in 2019 and caught 79 touchdowns in his career. He had 10 or more touchdown receptions in five seasons, a record for tight ends. A four-time first team All-Pro and five-time Pro Bowl selection, Gronkowski caught 521 passes for 7,861 yards and 79 touchdowns in 115 games from 2010-18. He added 81 catches for 1,163 yards and 12 touchdowns in 16 postseason contests. He won three Super Bowls with the Patriots. Among Gronkowski's other achievements that rank as the best in NFL history for a tight end are most single-season receiving touchdowns (17, in 2017) and career postseason receiving touchdowns (12). Hall of Fame wide receiver Jerry Rice is the only player with more career postseason receiving TDs. 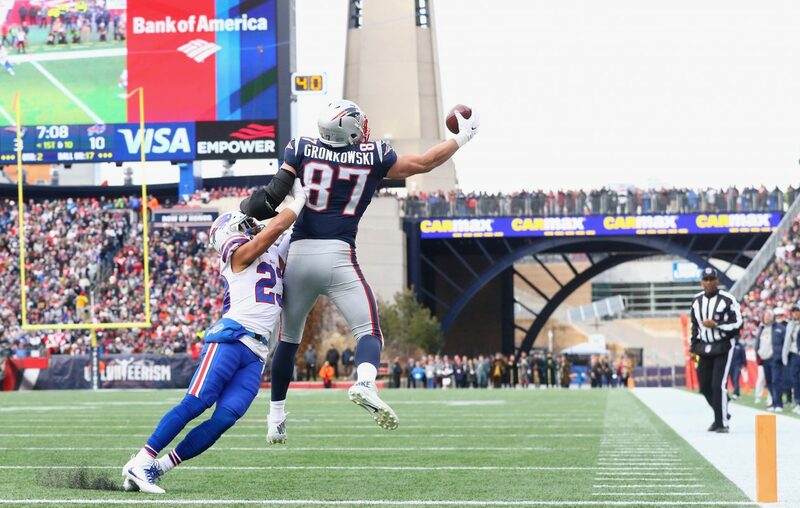 Gronkowski, who grew up in Williamsville and was named All-Western New York as a junior at Williamsville North before transferring for his senior year to Woodland Hills in Pittsburgh, enjoyed tormenting his hometown team. His 69 receptions, 1,070 yards and 12 touchdowns are all his highest against any opponent. His career accomplishments have not come without a physical toll: three back surgeries, four forearm surgeries, multiple concussions, a torn ACL and MCL, a bruised lung, a high-ankle sprain and countless other bumps and bruises. Tom Brady posted the following message to Gronkowski via Instagram: "What an honor and privledge (sic) to play with you these past nine years @gronk! You accomplished so much and our team was almost unbeatable when you were on the field! Your fun-loving, inspiring, and positive energy made an impact on everybody you came into contact with! Not just that, but for as great as a player you are, you are a better teammate and person. The NFL was a better place with you in it! But I have no doubt you will be a success in anything you do!! Love you pal!" In a statement, Patriots coach Bill Belichick described Gronkowski as "among the best, most complete players at his position to ever play." "Rob was a major reason why we won games and championships," Belichick said. "His elite combination of size, skill, intelligence, toughness and ability to perform in pressure situations set him apart." Owner Robert Kraft said in a statement that he has "never known him to have a bad day" and cited Gronkowski's "youthful exuberance" and said he was a "joy to be around." Gronk flirted with retirement after the Super Bowl last year when the Patriots lost to the Philadelphia Eagles and eventually announced in April that he would return for the 2018 season. He then gave some major hints of his intentions to call it quits in the days leading up to last February's Super Bowl in Atlanta. In 2018, his production wasn't at its typically dominant level. His 47 catches for 682 yards and three touchdowns were all the lowest of his career for a season in which he appeared in at least 13 games. However, Gronkowski was part of the biggest play in the Patriots' 13-3 victory against the Los Angeles Rams in Super Bowl LII, breaking open a defensive-driven contest by catching a 29-yard Brady pass – the game’s longest – to set up the game's only touchdown. After the game, there were more signs that Gronk's days as an NFL player were nearing their end. He spent an extra long time exchanging hugs and shaking hands around the podium. He embraced Brady and Belichick. He had another hug for Jonathan Kraft, the Patriots’ president and son of Robert Kraft. Finally, he threw his arms around receiver Julian Edelman for what seemed an eternity before finally heading into the locker room. “You relish these moments, you relish them all,” Gronkowski would tell reporters later. “You know how hard it is to get to the Super Bowl. We went three years in a row, we won two of the last three, we won three of the last five years. This is awesome to be part of this organization. I’m proud to be part of this team, I’m proud to be part of this organization." As for what's next, Gronkowski ended his Instagram post with, "Cheers to all who have been part of this journey, cheers to the past for the incredible memories, and a HUGE cheers to the uncertain of what's next."